It is not uncommon for people to see materials in use today and think they are a modern development, when in reality they date back to ancient times. This is the case with wood veneers. When you define wood veneers as thin pieces of wood, you’ll realize that there have been countless situations throughout history where desired wood species weren’t plentiful enough to craft what was needed so wood veneers became a necessity. One such incidence occurred in ancient Egypt where the lack of lush forests made for creative ingenuity. It wasn’t until the early 1800s that more effective and efficient means were developed for slicing wood veneers, which were then used to stretch valuable woods, such as walnut and mahogany, when crafting furniture. Pieces could be built with more available woods and then covered with wood veneers to get the rich appearance in demand at the time. Wood veneers continued to go through changes through the 1900s, and not always changes for the good. Some furniture makers began to use near tissue-paper thin veneers affixed to man-made materials, which although this made for inexpensive furniture, the pieces didn’t hold a candle to their predecessors in terms of quality. The good news, however, is that the thirst for quality wood veneers hasn’t died. 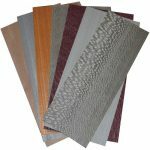 In fact, woodworking is gaining in popularity as a hobby in which wood veneer sheets can play a vital role. The number of wood species that can be obtained is off the charts. Here at Sauers & Company Veneers, we have more than 125 different species from light to dark colors, as well as dyed wood veneers in amazing colors. We also have inlay wood borders for that finishing touch to your project. Contact us today to learn more about the quality that our more than 50 years in the industry brings to our wood veneers.